The fact that the so-called "tonewoods" (mahogany, rosewood, spruce, ebony) that guitar makers have relied on for almost two centuries are now harder and harder (and much more expensive) to come by has left guitar makers scrambling to support replanting efforts in far flung locales and looking for sustainable alternatives that still imbue their instruments with pleasing tonal characteristics and eye-catching good looks. "Our beloved Brazilian rosewood was taken from us more than 25 years ago [and then] Adirondack spruce was logged out," reports Bob Taylor, founder of Taylor Guitars, a leading manufacturer of top-quality acoustic guitars that has been on the front lines of greener sourcing. "Today we see the signs of our current woods being diminished to a point of unavailability." To help counteract this industry-disrupting trend, Taylor launched a project in 2017 in partnership with the non-profit Congo Basin Institute to help local communities in Cameroon develop and plant different varieties of ebony to boost stocks of the now rare wood prized for use in guitar necks. "Our goal is to leave a lot more than we are taking," says Taylor. Cameroon wants to scale up the Ebony Project -- lauded as a global model for how public-private partnerships can be leveraged to mitigate climate change -- as a significant contributor to its overall deforestation and forest degradation emissions reduction goals. Of course, Taylor isn't the only acoustic guitar maker going big into ethically harvested woods. Martin, the premiere American acoustic guitar manufacturer since 1833, is now deep into woods certified by the Forest Stewardship Council (FSC), not to mention ebony-alternative fretboards made out of a pressed paper/resin material called Richlite. Likewise, Oregon-based Bedell makes all of its guitars in the U.S. out of woods certified to be "legally acquired in accordance with domestic and international regulations" regarding trafficking in rare or endangered species and are "ethically sourced" from trees "individually harvested in a manner that leaves the rest of the forest and ecological system as undisturbed as possible." And Canada's Seagull, which hires local talent at its factories and prides itself on its use of reclaimed wood and its support of replanting projects, is yet another pioneer in sustainable acoustic guitar manufacturing. Another way to avoid depleting wood reserves is by going for a guitar made out of another alternative material. Luna's Safari Bamboo is a 3/4 size acoustic guitar constructed out of sustainable bamboo and perfect for travelers. McPherson, Emerald, RainSong and KLOS all make high quality guitars out of carbon fiber. Meanwhile, Blackbird uses Ekoa, a bio composite derived from linen fiber and plant resin, instead of wood in its guitars. Of course, the greening of guitars isn't limited to acoustics. Big electric guitar manufacturers like Fender, Gibson, PRS, Ibanez, Yamaha and others have also been shifting toward sustainably harvested woods and alternative materials as well. And eco-conscious rockers will appreciate Finland's Flaxwood, which makes svelte-looking electric guitars out of a proprietary composite that reinforces injection-molded thermoplastics with flax-based natural fibers. 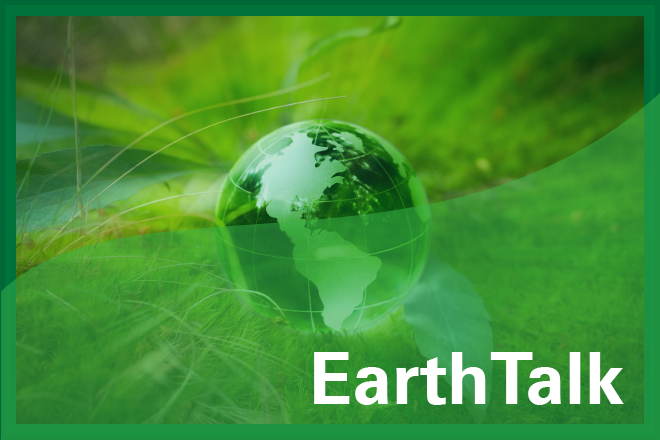 EarthTalk(r)is produced by Roddy Scheer & Doug Moss and is a registered trademark of the nonprofit EarthTalk. To donate, visit www.earthtalk.org. Send questions to: question@earthtalk.org. EarthTalk – Will gas-powered leaf blowers be outlawed?